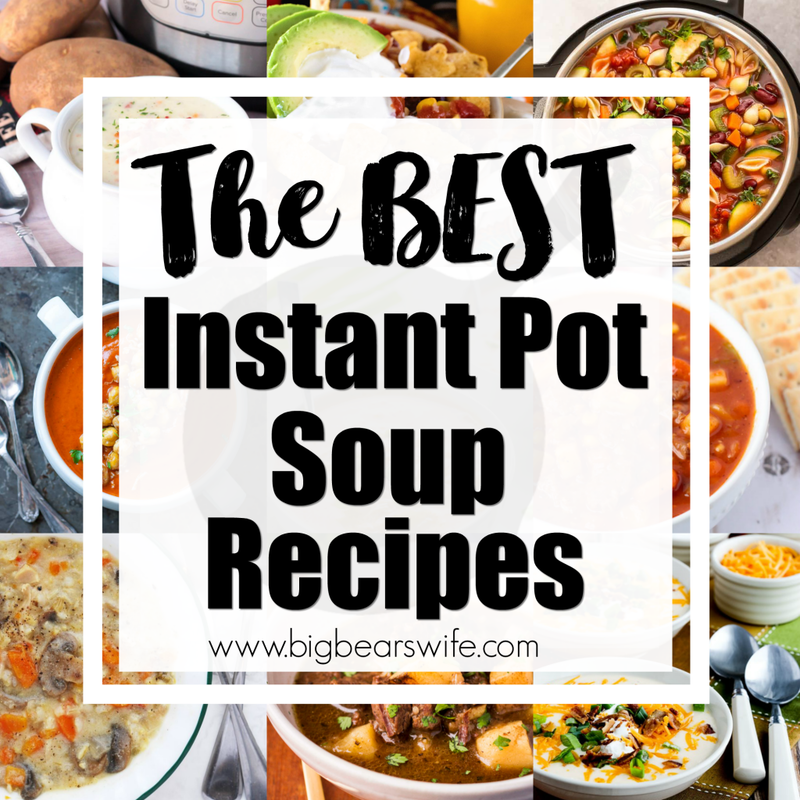 Need a great favor idea for a baby shower, wedding or birthday party? 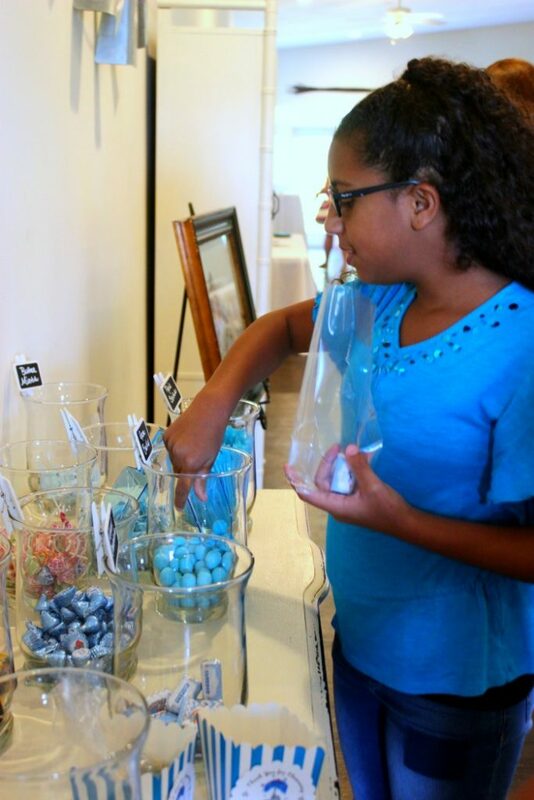 A Candy Bar is the perfect idea for favors, as you can customize it to match any theme or party color combo! 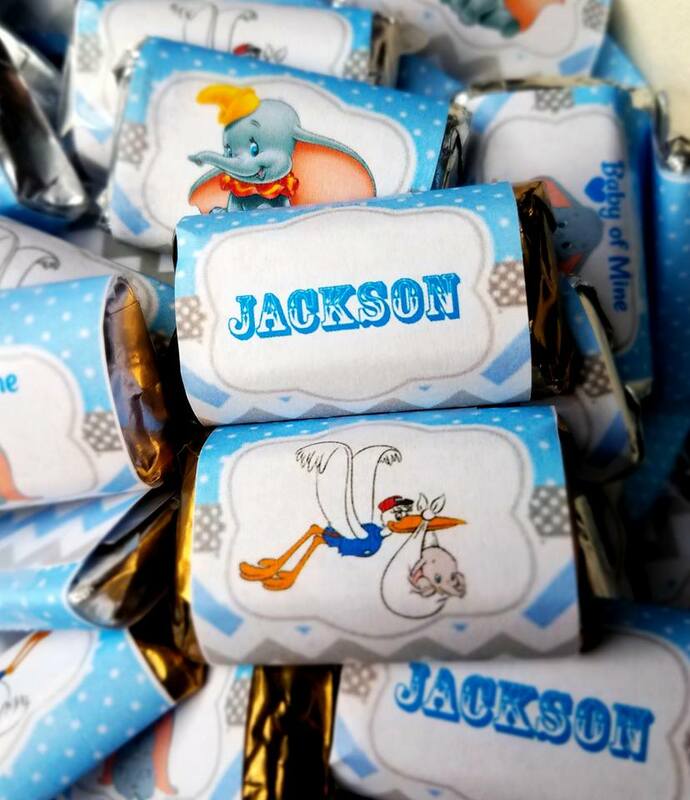 Oriental Trading Company did sent me some of the candy and items for our baby shower’s candy bar but all words and opinions are 100% mine as always! 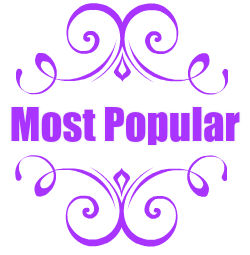 The last weekend of August was so special to us! We finally got to have our very own baby shower after 10 years of waiting! Oh and it turned out perfect! I haven’t gotten to share all of the photos from the day but I will soon! 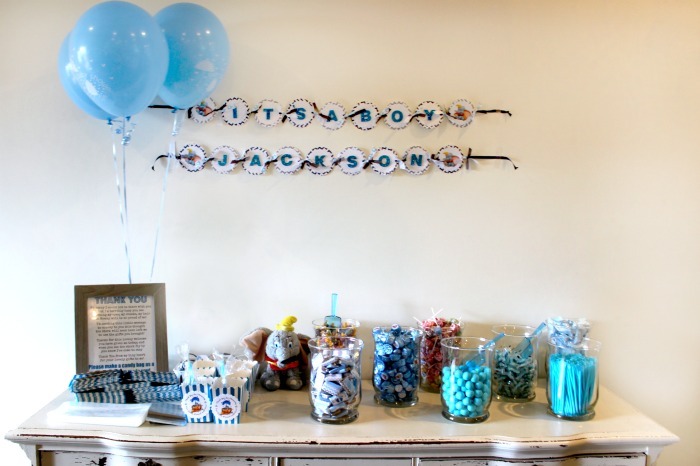 However, I did want to pop in and share a little bit of the party with y’all, the favor candy bar! Yep! 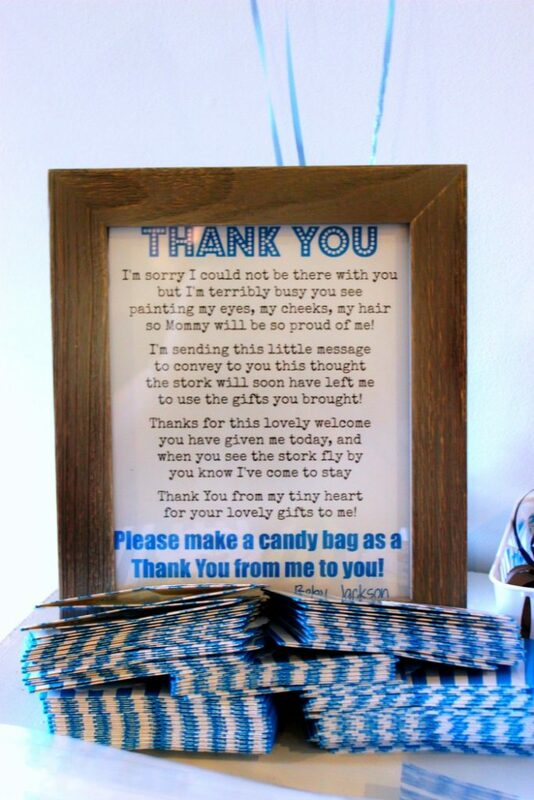 We did a candy bar for the Thank You favors for the baby shower and I love how it turned out! 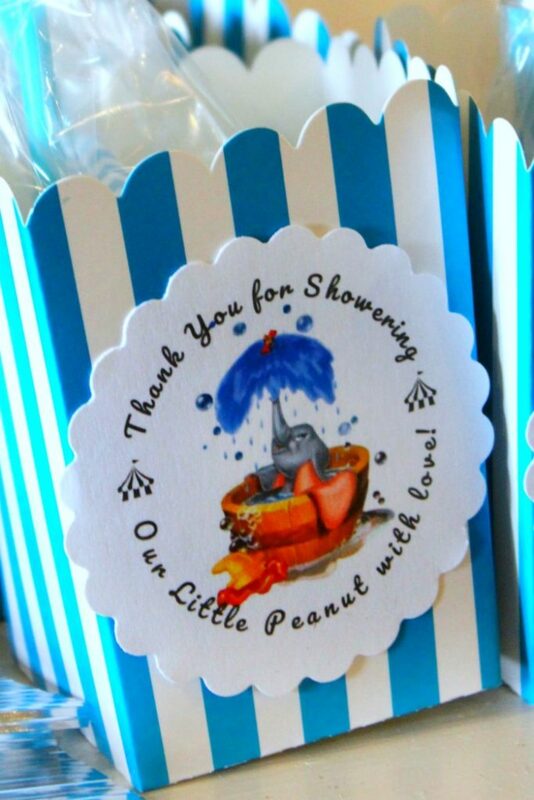 I originally wanted to have animal cracker boxes to go with the dumbo/dumbo circus theme but we ended up deciding against it. We had over 80 people RSVP and that would have been a TON of animal cracker boxes haha. So a candy bar idea came up and we went with that! 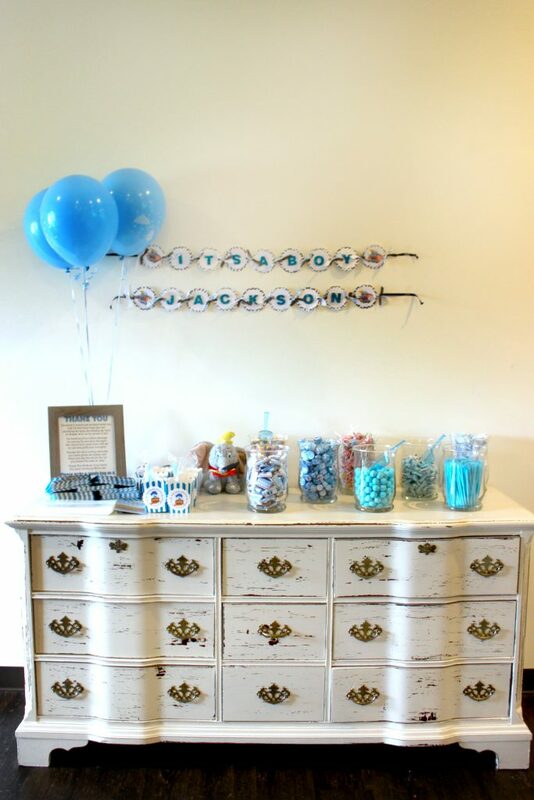 We set the candy bar favor bar up on a beautiful dresser that was at the event center but you can use any flat surface that you have available! We just loved how the dresser looked and it fit in perfectly with the baby shower theme. 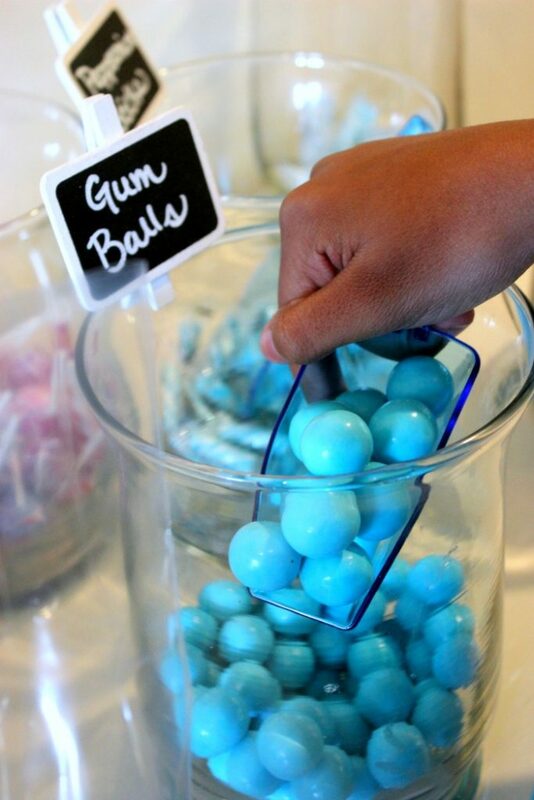 The #1 step to setting up a candy bar is picking a theme! Well, I suppose it doesn’t have to be a theme haha but maybe I should say that you should pick a theme or a color combo! 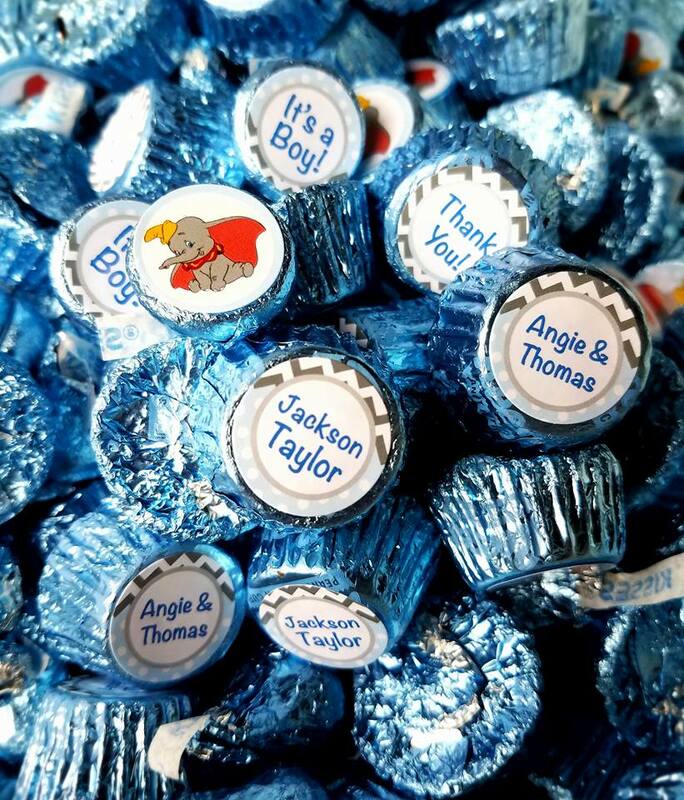 However all of the other candies followed the blue and white color combo that I was going with, since it was a Baby Boy baby shower. 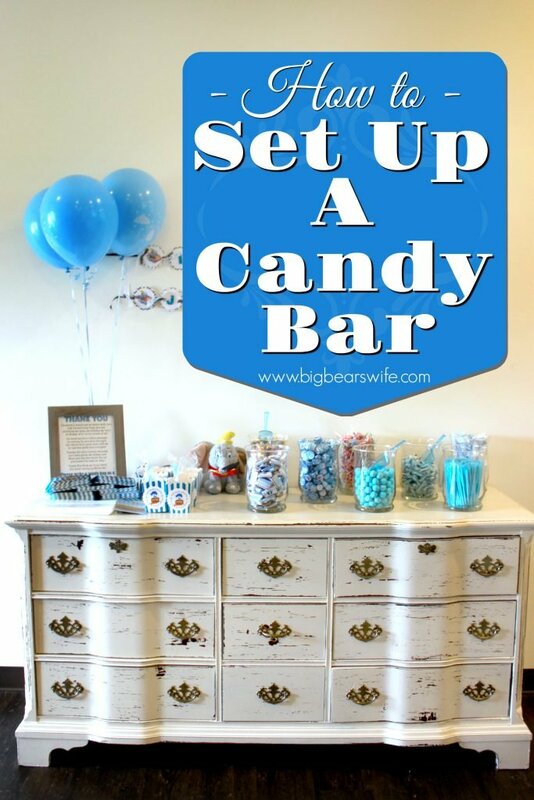 The second step to setting up your candy bar is to pick out the candy! I picked these candies because they were blue or blue and white PLUS all of them but one was individual wrapped! I liked that because I didn’t have to worry about people touching all of the candy. The gumballs were the only candy that wasn’t wrapped. So I got these blue scoops for them to make it easier for people to get them out without using their hands. Now onto a few little details! 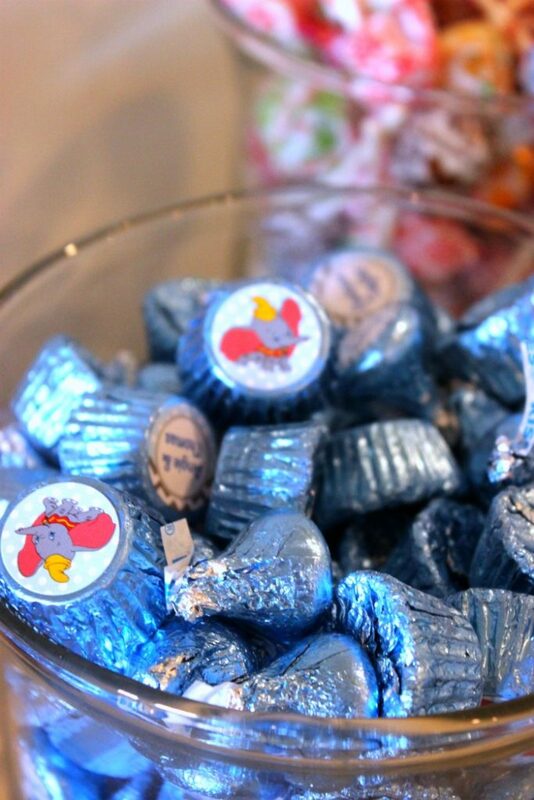 See these adorable little Kisses and Peanut Butter Cups?! 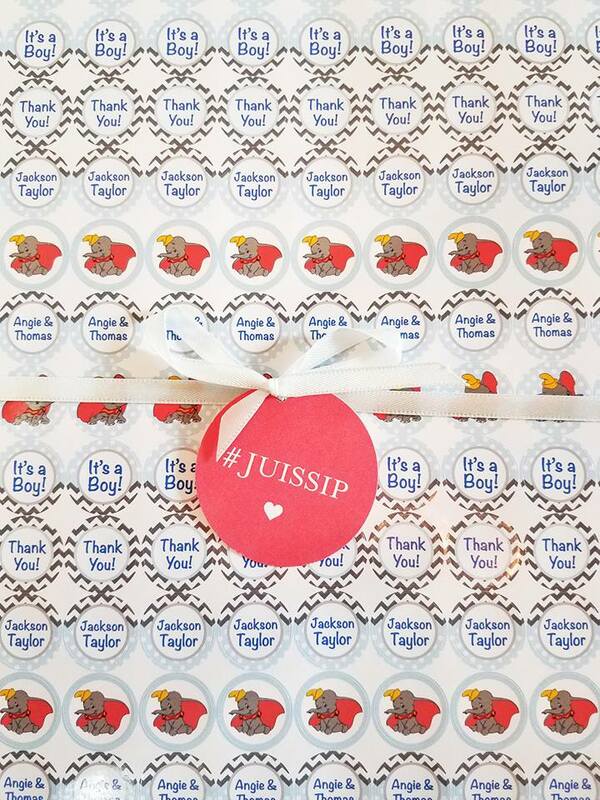 Well my sister in law ordered these cut little stickers from a shop on Etsy, called JUISSIP. Although I think they’re mainly for the bottoms of Hersey Kisses, we also stuck them on the tops of the mini Reese Peanut Butter Cups. Here is what they looked like on the sheet! Then there were the mini candy bars! I just got 2 bags of the Hershey Miniature candy bars and made labels to fit them! I used Microsoft word and PicMonkey.com to create the labels, printed them out and then just tapped them around the mini candy bars! 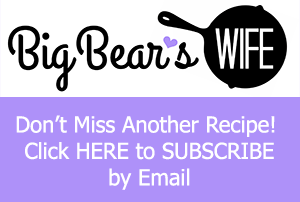 A super easy way to add a custom detail to the candy on your candy bar! 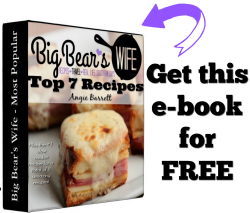 Let your guest know what kind of candy you’ve set out! 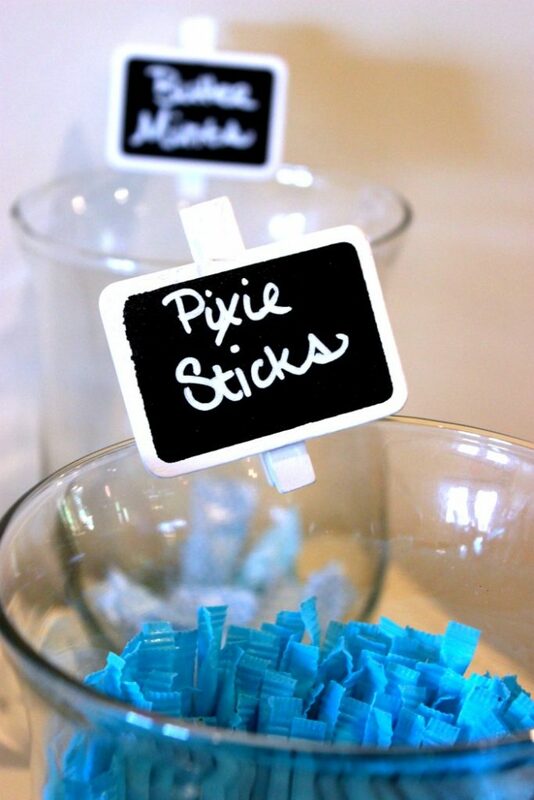 We used these little Chalkboard Place Cardholders from Oriental Trading to label the candy on the candy bar with a chalk marker. 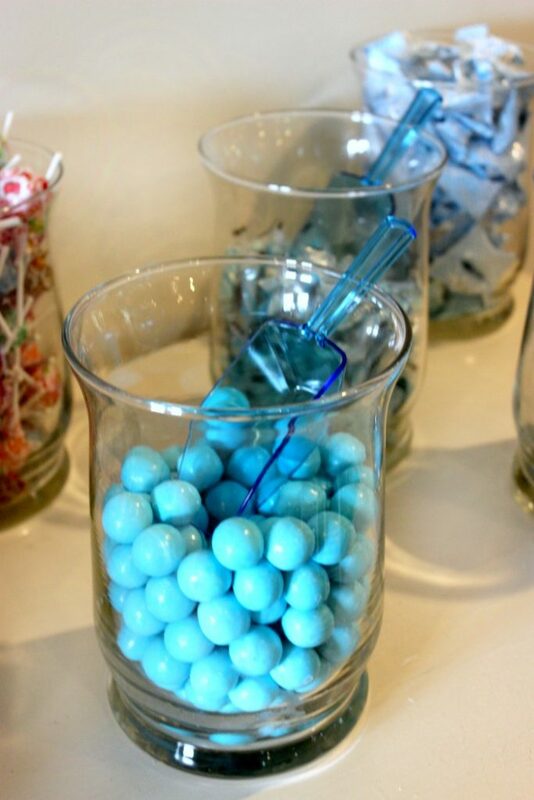 You don’t need a ton of decorations for your candy bar but a few little things add a nice touch and tie it into the party! I made two dumbo banners for the wall behind the candy bar and I added a little plush Dumbo since it was a Dumbo Themed Baby Shower. 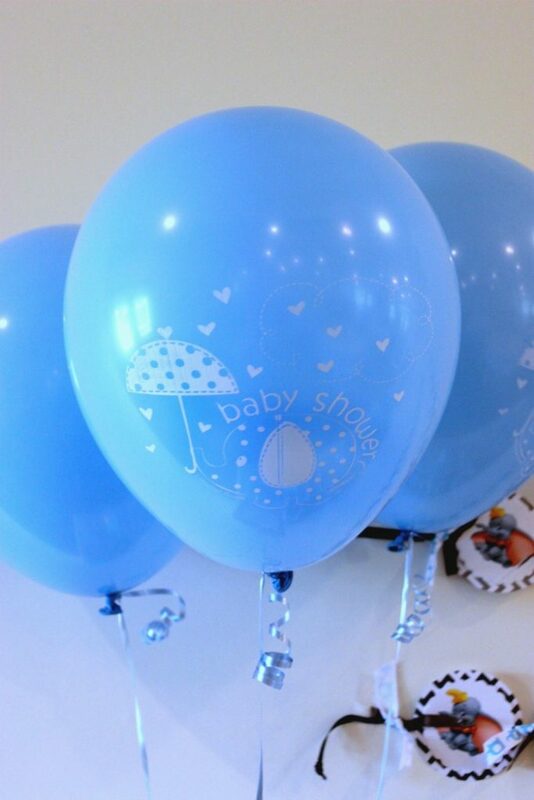 We added a few of these Blue Baby Shower Elephant Balloons to draw attention to the table. Then I added a Thank you sign! It was a little poem “from baby Jackson” to all of the guest at the party. I was also our “directions” on what all of the candy was for haha. painting my eyes, my cheeks, and hair, so Mommy will be so proud of me! the stork will soon have left me to use the gifts that you brought! You know I’ve come to stay! Now you could just use little plastic bags for the candy bar but I wanted a little something more. So I decided on boxes and bags! 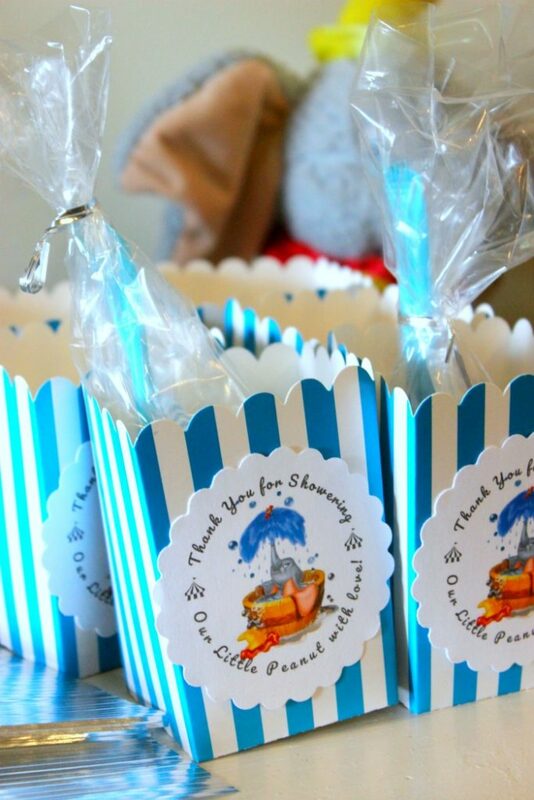 I picked out these cute mini blue striped popcorn boxes and clear plastic goodie bags. 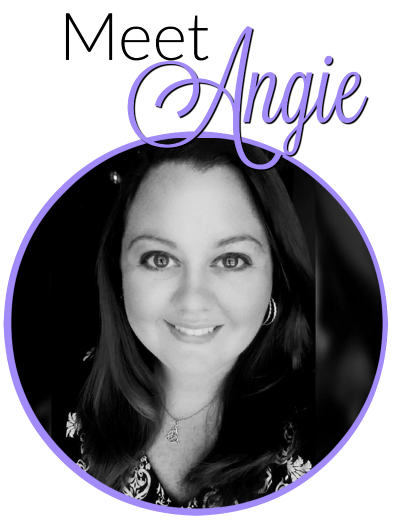 I made little Thank you labels on the computer and cut them out using a Scallop Circle 3 inch punch that I got at Hobby Lobby. Then we attached them to the boxes with glue dots. We left most of the boxes flat on the table so that they wouldn’t take up too much room. They were super easy to pop open so I don’t think anyone had any problems with that. I also put out the plastic bags and some ribbon, so that they could fill the bags with candy, tie them closed and drop them down into their little candy box. We also made a few examples before the party and set them out for everyone to see on the candy bar. 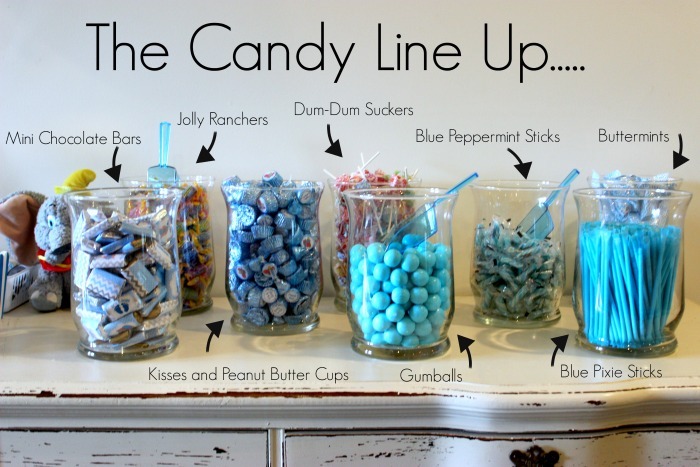 So that’s how we set up our candy bar for the favors for our baby shower! 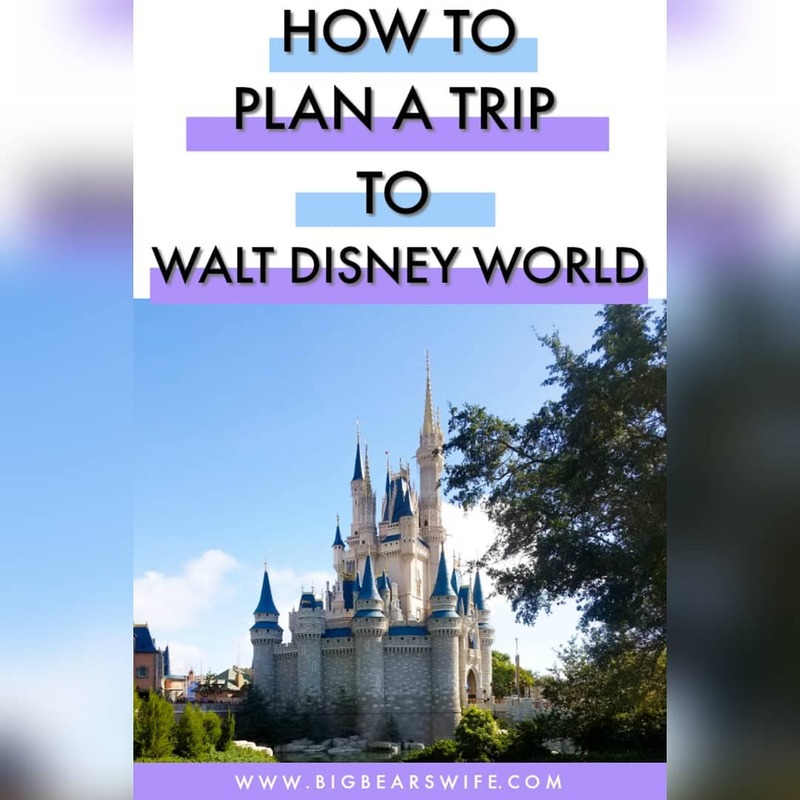 I loved the idea and by the looks of the lack of candy that was left over, I’d say that our guests loved it too!